Thomas Delohery is an a High Profile Award Winning International Visual Artist living in Australia. He has had 43 Solo Exhibitions and been part of 27 Group Exhibitions Worldwide, in such countries as, Ireland, Northern Ireland, England, Germany, Canada and Australia. Delohery deals mainly with the figure in his Art Practice. He studied at the National College of Art & Design in Dublin and the University of Ulster, Belfast. He graduated from the University of Ulster with a 1st Class Degree in Fine Art Painting in '93 and an M.F.A. in '97. He was a Black Swan Portrait Prize Finalist in 2016/2017. Melbourne Artist Thomas Delohery was shortlisted with his Portrait of Performance Artist and Curtin University (Perth) Professor Stelarc for the Black Swan Portrait Prize 2017. This is his second time being shortlisted as he was made a Finalist in the prestigious Black Swan Portrait Prize in 2016 with his painting of Author and Child Holocaust Survivor Henri Korn. The painting was on display at the Art Gallery of WA along with the other Finalists. This was also the case with Thomas Delohery's Portrait of Stelarc. Henri has asked to use Delohery's Artwork for his new book. He has done drawings and paintings on Racism, the rise of Neo-Nazism, Apartheid in South Africa, the Holocaust, the Killing Fields, the Vietnam War, the Conflict in Burma, Hostage Taking in Cambodia, the War in the Balkans in the 1990's, Che Guevara, German Writer Hermann Hesse, Authors and Holocaust Survivors Havka Folam Raban and Henri Korn, Acting Legend Richard Harris, Actor/Director Jared Harris of The Terror, The Crown and Madmen Fame, Actor and Musician Guy Pearce, Actor and Director Russell Crowe, Performance Artist and Curtin University Professor Stelarc, Musician/Singer/Actor Steve Wall, Actor Aidan Gillen, Actor Travis Fimmel, Actor Ben Mendelsohn of Animal Kingdom, Rogue One & Bloodline Fame, Actor Gustaf Skarsgard, Actor Alexander Ludwig, Actor/Director Sean Cronin, Actor Christopher Lambert, Actor Heath Ledger , Actor Max Brown, Actor/Director/Producer Jason Momoa, quaman, Actor Tom Cruise, Singer Kurt Cobain, Actress and Director Julie Delpy and Artists Frida Kahlo and Diego Rivera. Thomas has Co-Curated a Frida Kahlo inspired Group Exhibition with his partner Performance Artist Sandra Minchin Delohery. This was an International Group Show of Visual and Performance Artists. It was called The Wounded Deer and it opened on the 1st of October 2017 at the Convent Gallery, Daylesford, Victoria, Australia for 4 weeks. The Richard Harris International Film Festival(RHIFF) named Thomas Delohery the Artistic Curator of the Film Festival Portrait/Image Competition for 2015. This was the last year that the Festival used Delohery's Artwork to promote the Film Festival as one of Delohery's first duties in his new role was to find his replacement for 2016 by running a Portrait/Image Competition in 2015. The image had to be a drawing or painting of Acting Legend Richard Harris and the winning portrait was used to promote the Film Festival in 2016. Thomas was one of the four judges on the committee panel. Renowned Actor/Director Jared Harris of The Terror, Madmen and The Crown Fame, Award Winning Fashion Designer Natalie B . Coleman and Richard's life long friend Billy O'Reilly(Musician and Journalist) from the USA were the other three. Thomas Delohery created the Artwork to promote the International Richard Harris Film Festival 2013, 2014 and 2015. Thomas Delohery's Portrait's of Acting Legend Richard Harris are endorsed by the Harris Family as the official images of the Film Festival 2013/14/15. There is an ongoing file on his artwork in Yad Vashem, Jerusalem, where they have a piece of his Art in their Permanent Art Collection. Delohery has received many awards, the most recent being a presentation from the Lord Mayor of Limerick City in recognition for the Art work he has done over the years on the Acting Legend Richard Harris, as well as a Distinguished Talent Visa from Immigration Australia to stay and work in the country. Tacit Contemporary Art, Melbourne, Australia. Offically opened by renowned Australian Artist Victor Majzner. Island Arts Centre, Lisburn, Northern Ireland. Exhibition held in connection with International Holocaust Memorial Day. Signal Arts Centre, Bray, Co.Wicklow, Ireland. Exhibition offically opened by Holocaust Survivor, Suzi Diamond. Alley Arts and Conference Centre, Strabane,Co. Tyrone, Northern Ireland. Exhibition held in connection with Holocaust International Memorial Day. Holocaust, The Killing Fields of Cambodia and the war in Former Yugoslavia-reladed Exhibition at Kidogo Art Gallery, as part of the 'Interrogating Trauma: Arts and Media Responses to Collective Suffering' Conference, Perth, Western Australia. Awarded a grant by the Arts Council of Ireland for this Exhibition. Holocaust-related Solo Exhibition at Friar's Gate Theatre, Kilmallock, Co.Limerick, Ireland. Offically opened by Eamon Lenihan, 'Blue of the night,' Lyric FM Radio, RTE. PIER 21, Canada's Immigration Museum, Halifax, Canada. 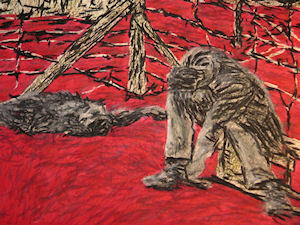 (Held in connection with Nova Scotia's Holocaust Education Week 2007) Thomas Delohery was awarded grants by the Arts Council of Ireland and Culture Ireland for this Exhibition. Toronto Centre for the Arts, Canada. Opened by Mrs. Elizabeth Comper, Fouder of FAST (Fighting Anti-Semitism Together). (Held in connection with Toronto's Holocaut Education Week 2007). Thomas Delohery was awarded an Honorarium from Yad Vashem Toronto, as well as a grant from the Arts Council of Ireland and Culture Ireland for this Exhibition. Toradh Gallery, Co.Meath, Ireland. The work on this Holocaust related Exhibition, 'Man-made' was carried out with the support of a grant from the European Association for Jewish Culture, London, UK. St.John's Theatre & Arts Centre, Listowel, Co.Kerry, Ireland. Opened by Billy Keane (son of renowned playwright John B. Keane). Friar's Gate Theatre, Kilmallock, Co. Limerick, Ireland. Offically opened by the late and great Richard Harris's three sons, Actor/Director Jared Harris (of MADMEN, The CROWN and SHERLOCK HOLMES.A GAME OF SHADOWS fame), Actor Jamie Harris and Director Damian Harris. The Wiener Library, Institute of Contemporary History, London, UK. (The World's oldest Holocaust Memorial Institution). The Changing Room Gallery, London, UK. Officially opened by Suzanne Barggett OBE, Head of the Department of Holocaust and Genocide History, Imperial War Museum, London). The Courthouse Arts Centre, Co.Wicklow,Ireland. Officially opened by Mickie Goldstein, Head of the Cultural Section, Israeli Embassy, Dublin, Ireland. The Old Market Arts Centre, Co.Waterford, Irealand. Officially opened by Peter Drinan (Cartoonist with the Irish Examiner). Clare Museum, Ennis, Co.Clare, Ireland. Offically opened by Poet Mark Whelan. Dundalk County Museum, Co.Louth, Ireland. Offically opened by Yanky Fachler. Main Gallery, Down Arts Centre, Co.Down, N.Ireland. Sunburst Gallery, Ards Arts Centre, Co. Down, N.Ireland. Offically opened by renowned Ulster Artist David Crone. Bourne Vincent Gallery, University of Limerick,Co.Limerick, Ireland. Offically opened by Prof. Dermot Keogh M.A. PhD, Head of History at the University College Cork (UCC), Co.Cork, Ireland. Clothworthy Arts Centre, Antrim, N.Ireland. Offically opened by Artist Anushiya Sundaralingam. N.U.I. Galway Art Gallery, Co.Galway, Ireland. Offically opened by Mike Fitzpatrick the then Director of Limerick City Gallery, presently the Head of Limerick School of Art and Design. Dunamaise Theatre and Arts Centre, Portlaoise, Co. Laois, Ireland. Offically opened by Holocaust Survivor Zoltan Zinn-Collis. The Market Place Gallery, Co.Armagh, N.Ireland. Offically opened by renowned Ulster Artist David Crone and former Head of the Fine Art Department at the University of Ulster, Belfast, N.Ireland. Signal Arts Centre, Bray, Co.Wicklow. Officially opened by Joe Tully, Arklow Arts Officer. Bank of Ireland Arts Centre, Dublin City, Ireland. Ojo Centre, Cologne, Germany. (Held in connection with anti-Fascist week). De Valera Library Gallery, Ennis, Co. Clare, Ireland. Officially opened by Artist and President of the R.H.A. Mick O'Dea. Linenhall Arts Centre, Castlebar, Co.Mayo, Ireland. Officially opened by Chairman Eamon Smith. The Belltable Arts Centre, Limerick City, Ireland. Offically opened by Artist Eamon O'Kane. Limerick City Gallery of Art, Co.Limerick, Ireland. Opened by renowned Limerick and Irish Artist John Shinnors. Mullingar Arts Centre, Co. Meath, Ireland. Tipperary Excel Centre, Co. Tipperary, Ireland. Offically opened by Co.Clare Arts Officer Siobhan Mulcahy. The DeValara Library Gallery, Co.Clare, Ireland. Officially opened by Artist and President of the R.H.A. in Dublin, Mick O'Dea. Black Swan Portrait Prize 2017 Group Exhibition, Art Galery of WA, Pert, Western Australia. Frida Kahlo inspired International Group Exhibition at the Convent Gallery, Victoria, Australia. Curated by Thomas Delohery and Sandra Minchin Delohery. Black Swan Portrait Prize 2016 Group Exhibition, Art Gallery of WA, Perth, Western Australia. 69 Smith Street Gallery, Fitzroy, Melbourne, Australia. 'Death be kind,' Upstairs at The Alderman, Brunswick East, Melbourne, Australia. Hunt Museum, Limerick City, Ireland. The Jelly Leg'd Chicken Arts Centre, Reading, UK. Cavancor Gallery, Lifford, Co.Donegal. Offically opened by John O'Sullivan, IONA Technologies PLC. Kunstler Haus II, Bavaria, Germany. Siamsa Tire Arts Centre, Co. Kery, Ireland. Work selected by Declan McGonagle (former Director of IMMA). Gem House of Fine Art, Sullivan's Quay, Cork City, Ireland. Living Landscape, West Cork Arts Centre, Co. Cork, Ireland. (My work was recommended for this exhibition by renowned Ulster Artist and Secretary for the R.H.A., David Crone. 1 Oxford Street Gallery, Belfast, N.Ireland. Castle Court, Donegal Place, Belfast, N.Ireland. People's Colege, Adelaide Park, Belfast, N.Ireland. University of Ulster Permanent Collection, N.Ireland, UK. Oberpfalzwer, Kunstler Haus Permanent Collection, Bavaria, Germany. The Wiener Library Institute of Contemporary History, London, UK. (The world's oldest Holocaust Memorial Institution). The Art Collection, Yad Vashem Museum, The Holocaust Martyrs and Heroes Remembrance Authority, Jerusalem, Israel. Jewish Holocaust Centre, Melbourne, Australia. Suzanne Bardgett OBE, Head of Department of Holocaust and Genocide History, Imperial War Museum, London. Actor Jamie Harris,(Marvel's Agents of S.H.E.I.L.D.) UK and USA. Director Damian Harris, (The Rachael Papers) USA. Artist Eamon O'Kane, Bristol, UK. Classical Musician Anna Mantere, Hynikau, Finland. Holocast Survivor Herr Otto Schwerdt, Regensburg, Germany. German Artist Veronica Bolay, Ireland. Dr.Adam Brown, Lecturer at Deakin University, Melbourne, Australia. Mikie Goldstein, Former Head of the Cultural Section, Israeli Embassy, Ireland. Hagar Lipkin, Former Head of the Cultural Section, Israeli Embassy, Ireland. Allison Sullivan, (Actor Richard Harris's niece), Ireland. Eamon Lenihan, Presenter 'Blue of the night,'Lyric FM, RTE, Ireland. Dermot McCabe, (Former Head of Engineering at RTE), Ireland. Henry Robinson, Human Rights Campaigner, UK. Holocaust Survivor Zoltan Zinn-Collis, Ireland. Holocaust Survivor and Author Henri Korn, Australia. Holocaust Survivor Suzi Diamond, Ireland. Holocaust Survivor and Author (Chavka) Havka Folam Raban, Israel. Holocaust Survivor Olga Salomon, Israel. Holocaust Survivor Goldie Steiner, Canada. Renowned Artist Neil Shawcross, N.Ireland. Renowned Limerick and Irish Artist John Shinnors, Ireland. Artist Andrea Tuchezyora, Czech Republic. Michelle Bernshaw, Former Principal of King David, Australia. Many other works in private collections in Ireland, N.Ireland, UK, USA, Holland, Poland, Germany, Czech republic, Finland, Australia, Israel and Canada. 2013: Presentation from the Lord Mayor of Limerick City Ireland in recognition for all the art work he did to honour the legacy of one of Limerick's most famous sons, the late and great Richard Harris. 2012: Distinguished Talent Visa from Immigration Australia. 2008: Travel and Mobility Award from The Arts Council of Ireland to aid costs to Perth, Western Australia, where Thomas Delohery exhibited his Art as part of the 'Interrogating Trauma' International Conference. 2007: Honorarium from Yad Vashem Toronto to defray costs of having a Solo Exhibition in Toronto, Canada. 'Culture Ireland' Award to help defray costs of having two Solo Exhibitions in Canada in October and November 2007; one in Halifax and the other in Toronto, as well as conducting workshops and lectures in both places. 2006: European Association For Jewish Culture Visual Arts Grant from London to defray costs of a Solo Exhibition at the Toradh Gallery, Co.Meath, Ireland. 2005: Artist's Support Grant from Clare Arts Office and County Council to defray costs of a Solo Exhibition in the Clare Museum, Ireland. Travel and Mobility Award from the Arts Council of Ireland to travel to Poland and Lithuania for a 2 week seminar run by Yad Vashem, Jerusalem. 2004: Scholarship awarded by Yad Vashem, Jerusalem, for a 2 and a half week Holocaust Educators Course at Yad Vashem, The International School for Holocaust Studies, Israel, 27th June - 14th July 2004. Artist in Residence, Herzliya, Israel, 17th - 27th June and 14th July - 17th July. Travel and Mobility Award from the Arts Council of Ireland to travel to Israel for a month mainly to do interviews with Holocaust Survivors. Artist's Support Grant from Clare County Council to defray costs of a Solo Exhibition in the North of Ireland. 2002: Nominated for the A.I.B Art Prize by County Clare Arts Office and the De Valera Library Gallery, Ennis, Co.Clare, Ireland. Recipient of the first Tyrone Guthrie Centre International Bursary Scheme Award to go to Bavaria for a 4 week residency. Flights were also kindly covered by the Tyrone Guthrie Centre. Artist's Support Grant from Clare County Council to defray costs of a Solo Exhibition in Bray,Co. Wicklow, Ireland. 2001: Recipient of the Airlingus Travel Award, by the Arts Council of Ireland to travel to Germany for research. Artist's Support Grant from the Clare County Council to defray costs of having a Solo Exhibition in Clare. MILLS ARTIST PAINTS TO THE MAX. O’Callaghans’s Mills Artist Thomas Delohery, now based in Australia, has based his latest series of portraits on Max Brown, an Asian Australian Actor/Producer with an Irish grandmother. Max cut his acting teeth featuring in a few episodes of Neighbours and Home and Away and is due to appear in Glitch, Season 3. Thomas Delohery said he was BEYOND DELIGHTED when Max accepted his offer to sit for him for a series of portrait. The first paintings Delohery did of Max took three months to paint. They are a diptych called, Diversity Rising, Portrait of Au Actor Max Brown. Delohery painted the figure of Max a little to the left as he wanted to highlight the bright future and career ahead of Max to the right. Max has appeared in hit shows such as Glitch and Secret City. Thomas Delohery feels very fortunate that he was able to draw Max from life before Max’s career goes into hyper-drive. Delohery is planning to enter his Portraits of Max Brown into Australia’s biggest Portrait Prize in 2019, the Archibald Portrait Prize. DELOHERY MAKES PORTRAIT PRIZE AGAIN. O’CALLAGHAN’S Mills artist Thomas Delohery, who is now based in Australia, has been shortlisted for the Black Swan Portrait Prize for the second time. This year, the artist has been selected for his painting of iconic performance artist and Curtin University professor Stelarc, from Perth, and puts him among the top 140 portrait artists in Australia for the second year running. Thomas explained that his wife, Sandra Minchin Delohery, made the introduction to Stelarc. lot of amazing projects, not least for the fact that he had an ear surgically attached to one of his arms, Thomas outlined. As part of the shortlisting, Thomas will have the portrait exhibited in the Art Gallery of Western Australia. Having received the news, he said, I feel so thrilled to be shortlisted. My muse and model Stelarc is delighted with my portrait of him and chuffed that his portrait will be exhibited. He described Stelarc as having an infectious laugh and a brilliant mind and outlined where he got the inspiration for his piece. ideas for his art practice floating around. My colour palette was inspired by a beautiful black and white photograph I saw of Australian actor Travis Fimmel from Vikings, he said. The award night will be held on November 10 at the Art Gallery of Western Australia. and Gavin Hogg, Cork artist Suzy O’Mullane, LSAD lecturer Breda Lynch and Limerick-based Austrian artistic dancer Isabella Oberlander. The show runs until the end of October. THOMAS DELOHERY SHORTLISTED FOR PORTRAITURE PRIZE. Kangan Institute Corporate News. We wish to congratulate Kangan Institute Visual Art Teacher Thomas Delohery on his shortlisting for the BLACK SWAN PORTRAITURE PRIZE OF 2017. The Black Swan is one of Australia's richest prizes for portraiture, bringing together Australia's top Artists for an incomparable exhibition and Awards Night on the 10th November. We are extremely proud that Thomas has once again been shortlisted for this prestigious award - a nomination that recognises him as being one of the best portrait artists in this country. I felt joy and huge relief at getting nominated. Not just for me but for my wife Sandra as she had a knot in her stomach for days coming up to the announcement. She knew how much getting shortlisted meant for me. Delohery chose to paint a portrait of Curtin University Professor Stelarc for this year's award. Thomas was humbled to have Stelarc - himself a prolific and maverick internation artist - agree to be painted and ecstatic that his muse was delighted with the finished painting. I have always been interested in the human face and figure, especially in conflict. I think the subject matter chooses the artist and not the other way around. Thomas currently teaches visual art as part of Kangan Institute's Victorian Certificate of Applied Learning (VCAL) program at Broadmeadows and Richmond campues. He hightlights that his passion for arts and creative accomplishments in industry provide a rich source of content for his classes. We have the chance to change young people's lives for the better and make them more resilient for the real World outside of TAFE Thomas says of his passion for teaching. His advice for budding artists wishing to follow in his footsteps? Be yourself, be original. Learn the rules before you break them. When you do well always give back. Out & About. The Local. ARTISTS throughout the world have been inspired by the genius of Frida Kahlo. Now an exhibition called The Wounded Deer reflecting her work is coming to Daylesford. It will be co-curated by husband and wife team Thomas Delohery and Sandra Minchin and feature contemporary Irish and Melbourne based artists. The idea is to show how Kahlo's legacy can affect and drive new works. The artists responded with what is said to be a beautiful, detailed and tumultuous show that reveals an intense connection to her work. Wounded Deer opens at the Convent Gallery Daylesford on Sunday October 1 with a live performance by Sandra Minchin at 2pm and the official opening at 2.30pm. She is an internationally-noted contemporary artist/curator and a cancer survivor, who developed a reputation for radical departures in live art, print, film and photography. Her collaborator, Thomas Delohery, is a Melbourne-based contemporary visual artist who has had 43 solo exhibition and been a part of 25 group exhibitions worldwide. Other artists in the show include Suzy O'Mullane, Robert Ryan, Breda Lynch, Gavin Hogg and Inka Alexander, as well as live art performances by dance artist Isabella Oberlander, Minchin and Rochelle Quantock. The exhibition runs until Saturday, October 28. Two men whose friendship crosses generations are thrilled to be travelling together to West Australia later this year. Thomas Delohery, an award-winning visual artist, originally from Ireland and now resident in Melbourne, has been named a finalist in the prestigious Black Swan Portrait 2016 in Western Australia. His muse is author and child Holocaust Survivor Henri Korn. Henri has written two books about his life - Saviours: The Story of a Jewish Altar Boy and My Past is my Future. We are as excited as schoolboys to be travelling to Perth for the announcement of the prize winner the artist told J-Wire. Korn, who wants to use Delohery's artwork for the front cover of his third book is a guide at the Jewish Holocaust Centre Melbourne. Delohery first met Korn and his wife Sandra in 2011 when Delohery was having his first Holocaust related solo exhibition in Melbourne. The two men met up later that same year when the artist was involved with a group exhibition called Forever In Our Hearts where they used Delohery's artwork to promote the show. In 2014 the pair got together again when Deakin University and the Jewish Holocaust Centre Melbourne were hosting a conference _ The Future of the Past: Representing the Holocaust, Genocide and Mass Trauma in the 21st Century. Delohery's artwork was used to promote the conference. The friendship was rekindled and Delohery and his wife, Artist Sandra Minchin, regard themselves as very fortunate to get to spend time with Sandra and Henri Korn on a regular basis. The artist asked Henri to sit for him again so he could try to capture what he describes as the wonderful presence that Henri exudes. Delohery has painted Henri for two other major portrait prizes, the Archibald Prize and Doug Moran National Portrait Prize. When he got news in early August that he was made a finalist with his latest painting of Korn called, I'm still here, Delohery says he was Beside myself. The finalists' work will be on display from 8 October at the Art Gallery of WA and the outright winner of The Black Swan Prize will be announced on 14 October 2016. SOME OF OUR ALUMNI IN THE SPOTLIGHT. University of Ulster NEWSLETTER. Thomas Delohery, MFA Fine Art 1997 and BA Hons Fine Art 1993, Belfast. Thomas Delohery is an award winning international Visual Artist living in Melbourne. He was awarded a distinguished talent visa to stay and work in Australia. Thomas was lucky to have artists David Crone and Mark Ainsworth as his tutors. He has had 43 solo exhibitions and 24 group exhibitions worldwide. Recently Madmen star actor/director Jared Harris sat for him so he could compete in the Archibald Painting Prize 2016, Australia. Thomas has painted author and Holocaust Survivor Henri Korn to compete in the Dough Moran Portrait Prize and the Black Swan Prize 2016, of which he was recently named a finalist. Henri will use Thomas's Art for the front cover of his new book. Thomas is married to Irish artist Sandra Minchin Delohery and they are co-curating a Frida Kahlo inspired exhibition The Wounded Deer to be held in Convent Gallery, Daylesford, Regional Victoria in September and October 2017. The show consists of five Irish and two Australian artists and they intend to have the show travel to Ireland and Northern Ireland in 2018. O'Callaghan's Mills award-winning visual artist Thomas Delohery has been named as a finalist in the Black Swan Portrait Prize 2016. Thomas Delohery, who now resides in Melbourne, having been awarded a distinguished talent visa, has been named as a finalist in the prestigious Black Swan Portrait Prize 2016 in Western Australia. The East Clare artist's muse is author and child Holocaust survivor, Henri Korn, whom he has painted for two major portrait prizes this year, the Doug Moran and the Black Swan. Henri has written two books, Saviours: The Story of a Jewish Altar Boy and My Past is My Future, and wants to use Thomas' artwork for the front cover of his latest book. Thomas first met Henri and his wife, Sandra, in 2011, when Delohery was having his first Holocaust-related solo exhibition in Melbourne. Thomas then met up with Henri later that same year, when he was involved with a group exhibition called Forever in our Hearts, which used Delohery's artwork to promote the show. In 2014, the pair met up again, when Deakin University and the Jewish Holocaust Centre, Melbourne, were hosting a conference called The Future of the Past. It looked at the Holocaust, genocide and mass trauma in the 21st century and Delohery's artwork was used to promote the conference. The friendship was rekindled and Thomas has been very fortunate to get to spend time with Sandra and Henri Korn on a regular basis. The next logical step, according to Thomas, was to ask Henri to sit for him so he could try and paint that wonderful presence that Henri exudes. Thomas said he was beside himself when he got news last Friday that he was named a finalist with his painting of Henri Korn, simply called I'm Still Here. He explained how this nomination came about. When I moved to Melbourne in 2010, in a lot of respects, I had to start again, from trying to get exhibitions to art teaching. Australian artists had mentioned to me about the top three portrait competitions here, the Black Swan Portrait Prize, the Doug Moran Portrait Prize and the Archibald Prize. I put in twice for the Archibald, first with Henri Korn and then with actor/director, Jarred Harris. I got good press but I didn't get selected. Thousands put in for these prizes so the competition is huge. I put in for the Doug Moran last year and didn't make it either. This is my first time putting in for the Black Swan Prize so you can imagine my shock when I logged on and I saw my portrait of Henri staring back at me in the finalists section. I logged back out and logged back in to see if it would still be there, as if I was dreaming it, he said. He explained that Henri is now 87 and his health hasn't been great lately. I think my portrait of him getting into the Black Swan and to have it on display in the Art Gallery of WA (Western Australia) will do him the world of good. Becoming a finalist with my portrait of Henri is, for me, the real prize; getting the accolade of winner of the Black Swan Portrait Prize 2016 would be the icing on the cake, he concluded. The finalists' work will be on sisplay from October 8 at the Art Gallery of WA and the outright winner of the Black Swan Portrait Prize wiill be announced later that week. The LSAD trained art Thomas Delohery is a finalist in the Black Swan Portrait Prize 2016 in Western Australia. Delohery now lives in Melbourne and has been resident in Oz for years, having been awarded a Distinguished Talent Visa. The subject of the Clare painter's entry is Holocaust survivor Henri Korn who works in the Jewish Holocaust Centre in Melbourne. Korn has written autobiographical works, Saviours: The Story of a Jewish Altar Boy and My Past is my Future; he would like to use Delohery's artwork on the cover of his lateast publication. Black Swan finalist's work will be on display from October 8 at the Art Gallery of WA and the winners of three sponsored prizes totalling 77,500 announced a week later. Delohery keeps close links to home and was judge last year to the annual Richard Harris Portrait Competition, a sidebar to the film festival which this year will open on October 27 to run to five days over the bank holiday weekend. MAD Men star Jared Harris sat for O'Callaghan's Mills artist Thomas Delohery, so that he could compete for the Archibald Prize 2016. As well as being a renowned actor in his own right, Jared Harris is a son of the late Richard Harris. Thomas first met his subject in Kilkee on the day a statue was being unveiled in honour of Richard Harris in October 2006. The next day, Jared and some friends and relatives went to see the first of Thomas's five tribute exhibitions to his father. After drawing Jared from life, Delohery started the background/surface of the main painting by doing six further studies of Jared Harris in various roles from The Notorious Bettie Page, The Curious Case of Benjamin Button, Madmen Sherlock Holmes.A Game of Shadows, Lincoln and the Devil's Violinist. He then incorporated these studies onto the surface of his painting and drew and painted an overall image of Jared over them. The painting took more than seven months to complete and is called Actor Jared Harris: More than the Some of his Parts. Thomas said, When I was working on my paintings of Jared Harris, I was very much inspired not just by Jared's abilities as a character actor but also by an old black and white photograph I saw once of Irish-born painter Francis Bacon. Some of the six studies are slightly visible but the main image of Jared is more, larger than the sum of the other parts. Thomas is now based in Australia and has had dozens of exhibitions around the world in England, Germany and Canada, as well as Ireland and Australia. Some of the themes Thomas has dealt with include racism, Apartheid, the Vietnam War, hostage-taking in Cambodia and the war in the Balkans. By Owen Ryan. Actor Jared Harris, the star of Mad Men and son of Limerick's most famous thespians, sat for Limerick artist Thomas Delohery for these sketches. Delohery, who used to live on the Ennis Road but now resides in Australia, undertook these portraits for the prestigious Archibald Prize 2016. Finalists will be announced on July 7. The artist was in Limerick late last year in his role as artistic curator of the portrait competition under the Richard Harris International Film Festival, and got Jared to sit for him. The pair first met in Kilkee when the statue was unveiled in honour of Richard Harris in 2006. After drawing Jared from life, Delohery started the background/surface of the main painting by doing six further studies of Jared Harris in his various roles from The Notorious Bettie Page, The Curious Case of Benjamin Button, Mad Men, Sherlock Holmes.A Game of Shadows, Lincoln and Paganini, the Devil's Violinist. Delohery then incorporated these 6 studies onto the surface of his painting and then drew and painted his overall image of Jared Harris over them. The painting took over seven months to complete. The artwork is called, Actor Jared Harris: More than the some of his parts. When I was working on my painting of Jared Harris, I was very much inspired not just by Jared's abilities as a character actor but also by an old black and white photograph I saw one time of Irish born painter Francis Bacon, he said. International Visual Artist Thomas Delohery from O'Callaghan's Mills has been named the Artistic Curator for The Richard Harris International Film Festival 2015. This will be the last year the Festival uses Delohery's artwork to promote the Festival as one of his first duties in his new position is to promote an Image Competition to replace him. The RHIFF is looking for a new image of Richard Harris and has issued a call-out to all Visual Artists, whether trained or self-taught. The Artwork can be a painting or drawing. The winning image will promote the Film Festival for 2016. All details are on their website. Thomas Delohery, renowned Actor/Director Jared Harris of Madmen fame, Award Winning Fashion Designer Natalie B.Coleman and Richard's lifelong friend Billy O'Reilly from the USA will be the four judges. Delohery is also doing 60 Limited Edition prints of his image Richard Harris. Munster Forever. They will be signed by Delohery with a handful signed by the Harris Family as well. These limited edition prints are for sale and can be pre-ordered from the RHIFF website before the Film Festival. Delohery and his wife Sandra Minchin Delohery will be coming home for the event this October 23-25. Sandra is a PhD candidate at Deakin University in Melbourne. She is a renowned performance Artist and won a coveted grant from the Melbourne City Council this year. Sandra will be exhibiting in the National Portrait Gallery in Canberra in 2016. Her parents were Dennis and Jean Minchin who lived in Killaloe. WELL-known Clare artist, Thomas Delohery from O'Callaghan's Mills has been named the artistic curator for the Richard Harris International Film Festival (RHIFF) 2015 and he has said he is THRILLED by the accolade. This will be the last year they use Thomas's artwork to promote the festival, as one of his first duties in his new position is to promote an image competition to replace him. The RHIFF is looking for a new image of Richard Harris and they have issued a call-out to all visual artists, whether trained or self-taught, to submit an image. The artwork can be a painting or drawing and the winning image will promote the film festival for 2016. All details are on their website. Thomas, Richard's son, renowned actor/director Jared Harris of Madmen fame; award-winning fashion designer, Natalie B Coleman and Richard's life-long friend, Billy O'Reilly from the USA, will be the four judges. Thomas is also doing 60 limited-edition prints of his image, RICHARD HARRIS. MUNSTER FOREVER. They will all be signed by Thomas, with a handful signed by the Harris family as well. These limited-edition prints are for sale and can be pre-ordered from the RHIFF website before the festival. Thomas and his wife, Sandra Minchin Delohery, both of whom are based in Australia, will be coming home for the event, which will take place from October 23 to 25. Sandra is a PhD student at Deakin University in Melbourne. She is a renowned performance artist and won a coveted grant from the Melbourne City Council this year. She will be exhibiting in the National Portrait Gallery inn Canberra in 2016. Her parents were Dennis and Jean Minchin, who lived in Killaloe. Speaking to The Clare Champion, Thomas said he was THRILLED when he was asked to get involved. I was so thrilled when Zeb Moore, Sylvia Moore and Rob Gill, the original and current directors of the festival, contacted me a few months back, about possibly joining their team and curating an image competition that would find the face of the Richard Harris International Film Festival 2016, he explained. Thomas said that himself and the directors of the RHIFF have been working behind the scenes for the last few months, ironing out the deatails of the cometition, and he said they are expecting a very high standard. The RHIFF directors and I would like the winning entry to sum up Richard's strong, raw presence, which he had on screen, theatre and in real life. The image needs to have good contrast so as to print well for promotional purposes. Thomas said that actor/director, Jared Harris of Madmen fame and the middle son of Richard Harris has always hoped that the film festival would encompass the spirit and strong legacy that his father left behind. Zeb, Sylvia and Rob have worked hard to make this a reality. I hope my inclusion as artistic curator of this image competition will help in some small way to support the vision that the RHIFF directors, their sponsors and the Harris family have for the future success of the film festival and Richard's legacy, he concluded. BREAKING NEWS FOR CLARE PEOPLE AT HOME AND ABROAD. Thomas Delohery submits entry for Archibald Prize 2015. Award-winning Clare Artist Thomas Delohery has created a spectacular portrait of author and Holocaust Survivor Henri Korn for the Aribald Prize 2015. Delohery, who has just completed his entry for this year's prestigious Prize which will be held in the Art Gallery New South Wales, Australia, feels he has completed the most complete artwork of his career. It has been a hugely rewarding experience for Delohery to draw and paint Author and Holocaust survivor Henri Korn. The first drawing of Henri was done from life nearly a year ago and it has taken Delohery almost the year to complete this piece. Delohery has always felt so much of the history of the process of making an artwork goes unseen, but not this time. Delohery has depicted six A2 images of Henri initially thinking about the old passport photograph format, trying to visuall describe the two worlds that Henri inhabits, one the full of energy 85 year old writer and the other the traumatized child survivor, who when he closes his eyes is not just describing the event but it is reliving it. In his portrait of Henri there are 62 different images of Henri, there is the main six images spread out like dis-guarded photographs but they are resting on 56 photographs of the making of those six large images but at different stages of the creative process. You get to see the uncomfortable main images of the two worlds that Henri inhabits but you also get a glimpse into the artist's world and how he visually creates and tries to make sense of Henri's story, so as to give a more unique portrait of writer, survivor and artists response to his muse. Thomas Delohery is one of the most exciting contemporary visual artists who works in painting and drawing to hail from Ireland. His extraordinary work is challenging, thought proving and always visually stimulating. His expressionistic drawings and paintings have won him several awards, including a Distinguished Talent to Australia where he now resides. He was educated at the National College of Art and Design, Dublin and the University of Ulster, Belfast where he was awarded his Master's Degreee in Fine Art. He has had 43 Solo Exhibitions, several group shows and is exhibited and collected internationally. Thomas Delohery is not directly connected to the Holocaust but he has developed a sensivity towards the subject because of his research, interviews,his humanitarianism, empathy and attempt to understand the event. Rico Le Brun a postwar abstractionist and a non-jew insisted the Holocaust was a subject that no serious artist would neglect. The dehumanization, humilation and mass murder of European Jewry by Nazis was an event of unparalleled proportion. Like early Christian artists who tried to imagine the cruifixion of Jesus,artists are trying to artistically convey the horror and memory of the Holocaust. Artists like Robert Morris,Christain Boltanski, Johnathan Borofsky, Anselm Kierfer and Sue Coe are the new generation of artists who are dealing with issues of digression and the suffering of mankind.Before them George Gross, Otto Dix, Max Ernst, Salvador Dali and Pablo Picasso made incomparable political statements and reflected on the violence of the century in many of their works. In Thomas Deloherys work we see an artist who goes beyond trying to reproduce a memory or an event he did not experience,we find a silent and heartrendering amplication in his work of the fragility and brief duration in time of human beings who had no ordinary deaths.With each drawing we see small stories narrated with the atmosphere of death,they seem to announce the melancholy and desperation that the emotion of the end brings with it. When someone dies it is the little memory that truly disappears, everything that they knew, their stories, their favourite books,the music they listened to.. their memories,everything that forms us and constructs us disappears when we die....this memory of the past belongs to everyone, a fragment of a memory, an indivual memory. Thomas Deloherys presents an imposing, uncomfortable and poetic collection of work that reminds us that everyone has a death of their own. Thomas Delohery is an International Visual Artist who was born in Ireland. He has had 42 Solo Exhibitions and been part of 24 group exhibitions world wide, in such countries as, Ireland, Northern Ireland, England, Germany, Canada, and Australia. He has serverval pieces of art work in both private and public collections including in the permanent art collection of Yad Vashem, Jerusalem, and in the Wiener Library Institute of Contemporary History, London, UK (The world's oldest Holocaust Memorial Institution). He has been awarded travel and mobility awards from the Arts Council, Ireland and also from Culture Ireland and he recently recieved a Distinguished Talent Visa from Australian Immigration. Many thanks to Tom and the staff of Tacit Art Gallery for having me here this evening. I feel very honoured to launch Night But No Morning – the latest testament to the power of Tom's art and the depth of his talent. As I'm sure many of you here know, Tom is a prolific and multi award-winning artist with a passion for his subject matter that permeates everything he does. He is fast approaching 50 solo exhibitions and has contributed to an additional 24 group exhibitions. When I first met Tom in Fremantle at a trauma conference in December 2008, I was instantly impressed with his personal integrity, the quality of his work, and his dedication to the remembrance of the Holocaust. incomprehensible, Tom guides the viewer only so far along the road to understanding while allowing one's subjectivity and imagination to make sense of his traumatic imagery. My own research and teaching in Holocaust studies over the years (including my own indebtedness to the writings of Primo Levi) no doubt frames the prism through which I view Tom's evocative and provocative artwork. I can't help but relate many of the pieces to historical and cultural debates which have not been – and most likely never will be – resolved. Tom told me earlier that part of the inspiration for many of these paintings was to ‘bring fear back into secluded areas', to reveal that which is not meant to be revealed. This works on two levels, as not only was the nature of the Nazis' intentions shrouded in secrecy to deceive their victims – a secrecy Tom's artwork subverts – but the settings and experiences with which Tom's paintings are primarily concerned have often been marginalised by scholars, artists and commentators alike. The overwhelming focus on gas chambers and concentration camps has only relatively recently been joined by increased attention to Jewish experiences in the forests of Eastern Europe, whether it be as victims of mass shootings or as members of the partisans. The presence of women in resistance groups is also highlighted in the exhibition without resorting to gendered stereotypes or the voyeuristic tendencies of much popular Holocaust culture, contributing in its own way to countering the male-dominated conceptualisation of the event. gesturing to the reluctance, hesitation (and in some cases trauma) that perpetrators experienced – something that does not absolve them, but should nonetheless be acknowledged. The debate over perpetrator behaviour was sparked in the 1990s by Daniel Goldhagen's controversial study entitled Hitler's Willing Executioners, which argued that perpetrators were invariably and solely motivated by what he termed ‘exterminationist anti-Semitism'. In the years since, many scholars have countered this mono-causal view by pointing to the role of financial benefit, career advancement, the bureaucratisation of murder, and peer pressure. The debate is ongoing. The Irish artist Thomas Delohery, whose work has centred on the Holocaust for the last thirteen years and who acknowledges Levi as one of his main sources of inspiration, has had well-attended exhibitions in Australia; the latest )Shipwrecked in the Death Camps of Europe, held at the Tacit Contemporary Art gallery, Melbourne, in March-April 2011) owes its title to Levi's remark that liberation from the camps was a feeling comparable to being shipwrecked. Shipwrecked in the death camps of Europe. The abyss of the Holocaust presented a huge challenge for artists. How could one even begin to approach the subject through art? And yet, not surprisingly there was an immediate response by painters, poets and writers with the best weapon available to them - their art. So as soon as the news about the concentration camps begun to filter out in 1945 no lesser fifure than Picasso attempted to paint a picture about the Holocaust, titled The Charnel House. Since then, there has been a long line of artists around the world that continue to deal with the Holocaust. For some it has become an all consuming subject. As stated in the flyer accompanying this exhibition Tom has over the past 13 years focussed primarily on one theme in his art practice - the Holocaust. He became ineterested in the subject of the Holocaust during his student days in Ireland. He went on to complete a course on the Holocaust at Yad Vashem in Jerusalem, has visited numerous Holocaust museums around the world, interviewed Holocaust survivors - just to get some insight into this incomprehensibly gruesome event that has scarred humanity. This human tragedy has left an enormous, black hole on our collective consciousness - an emotional pit. Tom's art doesn't just rely on what he knows about the Holocaust, he is perhaps even more inspired and propelled by the depth of his emotional response to the event. One of his artistic influences is drawn from the Jewish painter Chaim Soutine. Soutin painted nature by capturing the inherent violence and beauty of it at the same time. Tom adopts Soutine's love of the expressive, the strength of colour, the immediacy of the brush stroke and an appreciation of beauty - even in the vulgarity of suffering. He begins with a photograph which to him is evidence, a record, a truth. He then edits it by focusing in on the idea he feels. These photographic images are taken from books, official records or exhibits, usually of people in concentration camps. These photographic images of people are transformed by his process of painting into a distressed space filled with eroded, pock marked, broken images. They turn into what appear to become dead, feral animal carcasses, resembling road kill at times. Carcasses of a strange species displaced and discarded in a spiritually frozen world. That is what has become of these once full human beings after they have been ravaged by the Holocaust. Tom's painting drawings are made up of a multitude of short, urgent strokes of pastel or paint. They become a kind of automatic handwriting. Apart from this personal text, he often incorporates printed text into his works as in the portraits that we see here tonight. This text is taken from the multitude of rules and regulations that governed the camps, collaged onto the paper and drawn over. Perhaps Tom is suggesting that these depicted individuals were absorbed into the rules and regulations by which they existed to such an extent that they became these rules. Together with the tattooed number on their arm, they became what Primo Levi called Muselman's - ghosts, hardly human, their human identity having been ripped out from them. They stare out at us blankly and non-judmentally. They almost seem to ask - is this what has become of us? Is this what we are capaple of doing to each other? Most of the paintings in this exhibition present us with images slightly out of focus, almost shadows or stains of a once vibrant humanity. They are disturbing, unnerving, uncomfortable to look at, yet they draw us into their world and don't let go! The cry of never again in response to the Holocaust has become rather hollow in light of recent history. So perhaps a more relevant outcry should be - never forget. Tom's art is an act of memorialising the Holocaust. The title of this exhibition is taken from a quote by Primo Levi's who referred to his liberation from the death camps - that it made him feel like being shipwrecked. Freedom and liberation must have hit all survivors like a huge, emotional tsunami. the question facing them was - what now? How do we begin to act human again? And indeed, if we take an overview of this exhibition, each painting captures a moment of this shipwreck of humanity; disoriented, dead or dying like bits of human flotsam in a sea of disbelief. For me, each of these paintings is a piece of the raft that makes me feel like I'm floating in a sea of human debris of the Holocaust. In front of these picture I feel totally helpless, disoriented and dislodged - shipwrecked in fact. In my view the power of art is the fact that it can make the intangible visible. This exhibition is perfect example of that power. I wish Tom every success. Interrogating Trauma Collective Suffering in Global Arts and Media. Edited by Mick Broderick and Antonia Traverso. First published 2011 by Routedge. Visual Artists Vicky Smith (England) and Thomas Delohery (Ireland), who respectively provided the images for the conference programme and this publication's front cover. The Sunday Business Post. Agenda. Ireland's cultural and lifestyle magazine. Since 1997, Clare artist Thomas Delohery's work has centred on the theme of the Holocaust. For the most part, it pays tribute to those who perished in it and honours their courage, suffering, humanity and various ways of resisting the Nazis. More than just people died in the Holocaust says Delohery. I think a certain part of humanity did. An exhibition called If This is a Man express these themes across across his works of mixed media on paper. Holocaust survivor Suzi Diamond opened his exhibition earlier this week. If This is a Man, by Thomas Delohery, runs at Signal Arts Centre, Bray, Co Wicklow until September 27. Mary Leland on the work of an artist fascinated by the late actor Richard Harris. For a selection of work by Thomas Delohery click here.